Honest Puck Theatre’s ‘It’s a Wonderful Life’. FRANK Capra’s “It’s A Wonderful Life” is considered one of the most critically acclaimed films ever made. It ranked as number 11 on the American Film Institute’s 1998 list of the 100 best American films. Initially released in 1946 starring James Stewart and Donna Reed, it’s a sentimental favourite that still works despite its age. 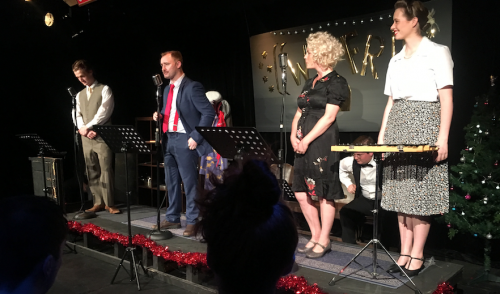 Adapted as a radio play by Joe Landry, it’s a great showcase for Honest Puck Theatre’s group of talented performers from the Canberra Academy Of Dramatic Art. Everyone in this excellent ensemble gives sharply etched, truthful characterisations in this fast-moving and visually clever production directed by James Scott. The cast of six – Hayden Splitt, Katherine Berry, Monica Engel, Colin Giles, Michael Ubrihien and James Scott – play a multitude of believable characters from small town America. Accents are well-maintained and each cast member is able to move from character to character with lightning speed. The fun of watching a radio play performed is to see the actors moving swiftly between microphones as different characters and observing how sound effects are incorporated into the show for atmosphere. Of course, in real radio most people only heard the show over the air and their imagination did the rest. I closed my eyes for a few minutes during this production and had a completely different and fascinating experience. James Scott’s direction for this work is excellent. It runs at the right pace with in-depth characterisations and a strong visual sense as well as fine sound design. The cast members winking and smiling at the audience when not actually performing at the microphone gave the show a recording studio reality. “It’s A Wonderful Life” is a favourite movie for many people. It works wonderfully as a radio play, too.